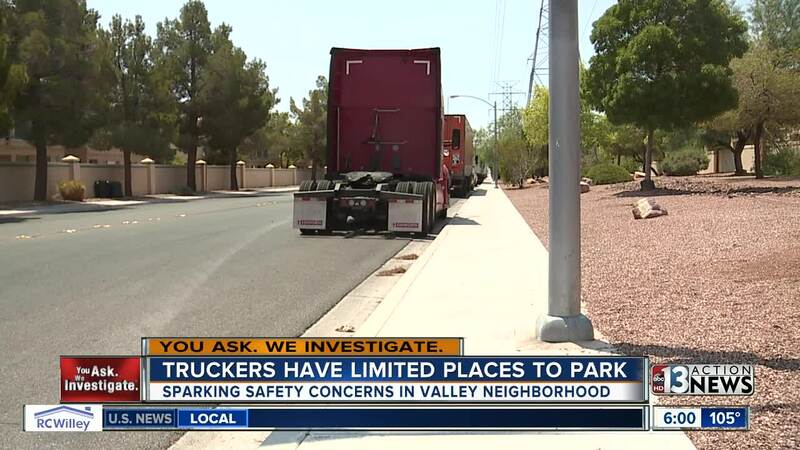 The Silver State's largest trade and advocacy group for truckers says there is a growing crisis across the Las Vegas valley and the country when it comes to commercial parking. Love them or hate them, trucks move 92 percent of all freight in Nevada, according to the Nevada Trucking Association. Contact 13 first reported the problem in July when neighbors complained they felt they were living in a " pop-up truck stop " near Decatur and Tropicana. Since the report, the topic has sparked a passionate debate on Facebook and raised a bigger question about the source of the trucking troubles. "I don't know where to park, I really don't know anymore," said Nancy Amezola, co-owner of LAN Transport based in Las Vegas. "It is a crisis," said Amezola. Amezola says her small business consisting of 3 big rigs has a big parking problem. Recently, Amezola received a $60 violation for parking an idle rig in a residential area. "We are not bugging anyone, we're just parking there for just a couple days while my husband can recuperate and has some rest," said Amezola. The Nevada Trucking Association says some trucking companies operate with razor-thin profit margins, averaging 1.75 percent. Any additional costs for parking, storage or parking-related violations can mean a big hardship, Amezola added. "Truck parking is a huge issue both within the state of Nevada and across the country," said Paul Enos, CEO of the Nevada Trucking Association. Enos says the land is at an expensive premium in Nevada and coupled with air quality regulations it makes a private truck stop endeavor cost prohibitive. Enos estimates a single truck stop facility could cost up to $10 million. He says the issue of parking, especially in residential areas, is a multi-part problem with safety and federal regulations at the forefront. "Truckers do not want to park in an unsafe place either," said Enos. "They don't want to park somewhere that will upset their neighbors but a lot of times they don't have another choice," he added. The Federal Motor Carrier Safety Administration has strict rules when it comes to truckers and rest. New electronic driver logs keep exact tallies for hours driven and too many violations can mean serious trouble for truckers. "It literally tells you when you have to stop, and when you don't stop you'll get a violation," said Amezola. "I hope a fix is coming," said Enos. "It is something we are aware of and it is something we are looking at and there is a study currently in place," he added. The trucker study in Nevada will end in July 2019 to help identify potential solutions. The Nevada Trucking Association predicts will take a public-private partnership to construct as many as 3 new truck stops around Las Vegas to alleviate the problem.